When faced with an unknown spot, try Saf-T-Solv first. Saf-T-Solv is specially formulated for carpet spotting but may also be used as a general purpose safety solvent and degreaser. Saf-T-Solv contains no cationic ingredients and is safe for all carpet, rug, drapery and upholstery fibers when used according to directions. 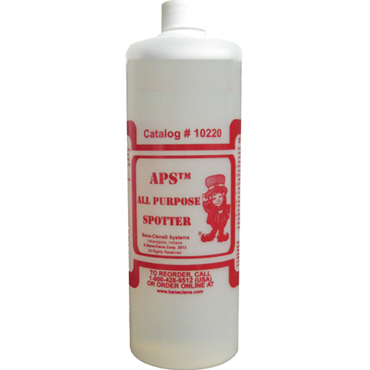 Solvent spotter product fully evaporates. 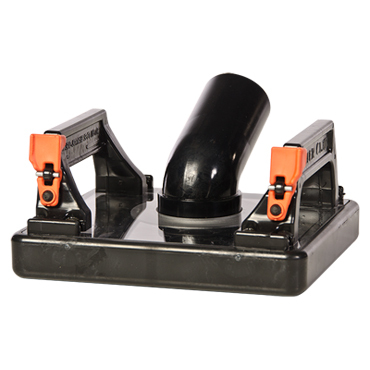 Saf-T-Solv penetrates deep, removing the toughest grease and oils. 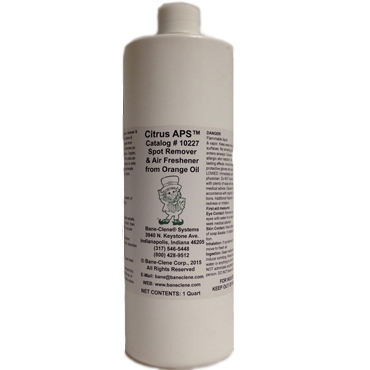 Use to rinse oily residue left by non-volatile dry solvents (POG). 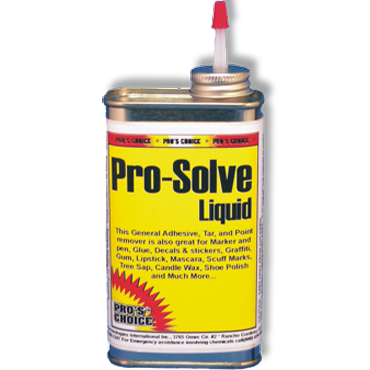 Dry solvent - no water in the product. 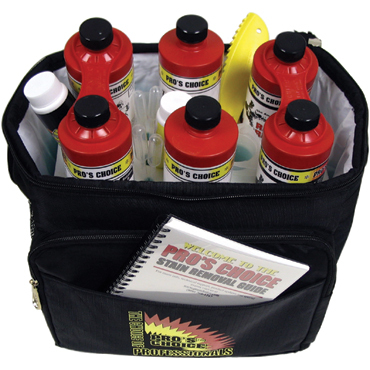 Ready to use in convenient quart bottles. 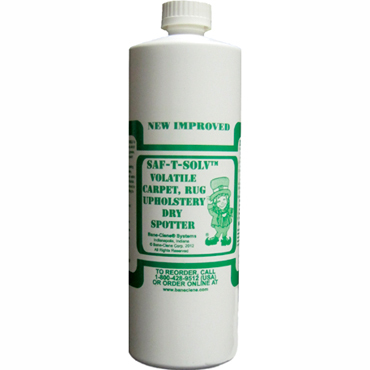 Double-Strength fast-drying Saf-T-Solv volatile non-residual Solvent Spot Remover is a blend of highly active, volatile, solvents that cuts through and removes such oily, greasy soils like glue, tar, grease, oil, polish, wax, cooking grease, gum, cosmetics & fresh paint. As shown in the image on the right, DO NOT pour Saf-T-Solv directly on carpet; instead apply with a towel. Approved Use: Safe for stain-resistant nylon carpet if used properly. Storage: Store in cool area. Keep container closed when not in use. 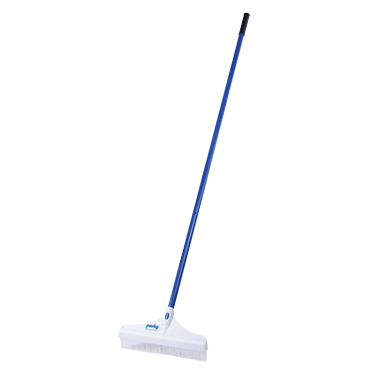 Test on carpet, rug or upholstery first before using. Do not over-wet latex-backed or sponge-backed rugs or carpets or foam-filled upholstery. Saf-T-Solv will dissolve latex, sponge and urethane foam. For spots or stains, pour on cloth; then work from outside of stained area to center with a circular motion - wear solvent-resistant rubber gloves. 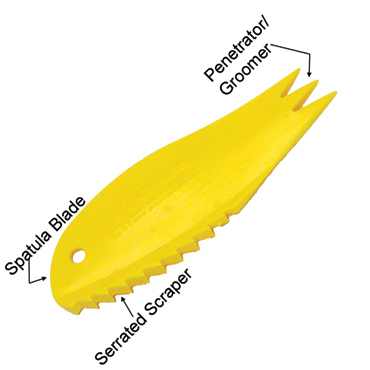 Work Saf-T-Solv into area with Pro’s Choice Carpet Shark or bone scraper. CAUTION: Excessive rubbing or brushing may result in distortion of carpet pile. 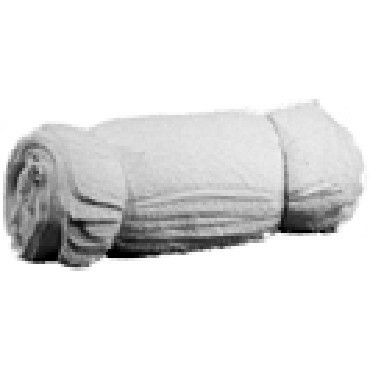 Blot with dry cloth, tissue or towel. If needed, wet extraction the area. 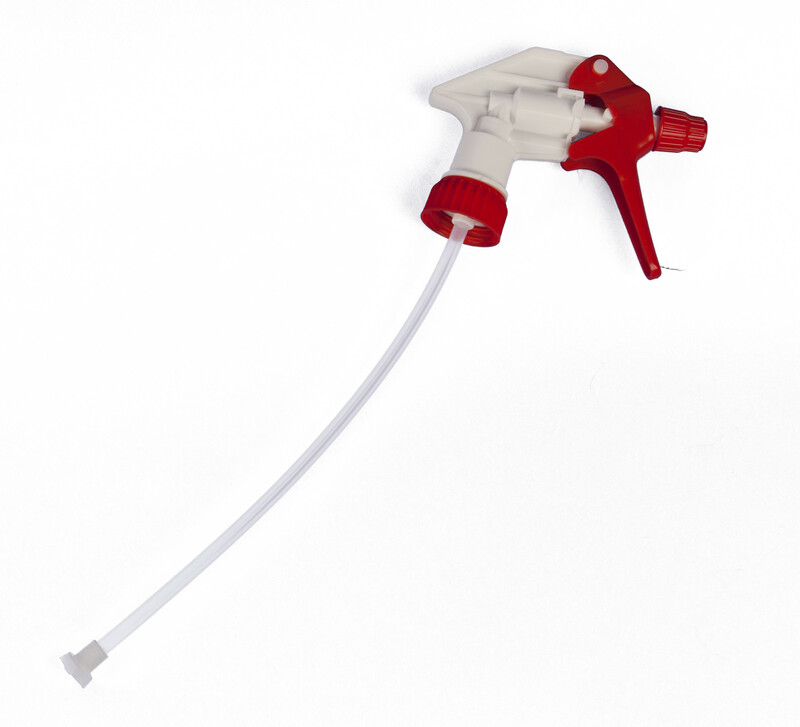 As shown in the image at the beginning of this article, DO NOT pour Saf-T-Solv directly on carpet; instead apply with a towel. 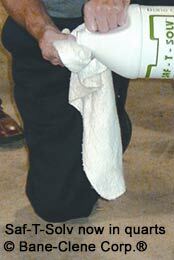 Applying solvent directly to a carpet may delaminate the carpet! Avoid skin contact. ALWAYS wear solvent-resistant rubber gloves when using any volatile dry solvent. 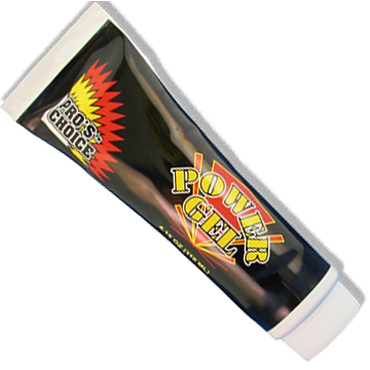 As with any volatile solvent, use with GOOD VENTILATION. 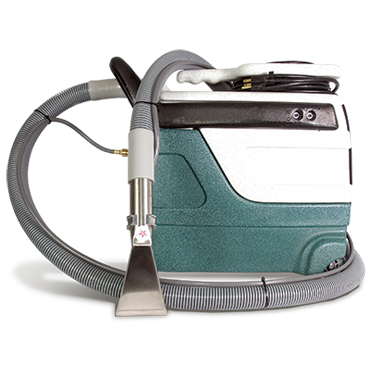 Volatile dry solvents such as Saf-T-Solv are for carpet, rug and upholstery spot cleaning, not for overall cleaning or prespray! Cannot be shipped via air. Do not dispose of Saf-T-Solv in drains. Keep away from fire, open flame and sparks. Do not get on the backing of carpet - it will cause delamination! Saf-T-Solv will dissolve foam blocks! Be sure to rinse thoroughly after use! NOT AVAILABLE FOR SALE IN CALIFORNIA! Certain restrictions may apply in some states. Click the “Usage & Tips” tab above for article titled “DIRECTIONS FOR REMOVING OILY, GREASY SPOTS AND STAINS FROM CARPETS, RUGS, UPHOLSTERY AND DRAPES WITH SAF-T-SOLV”. 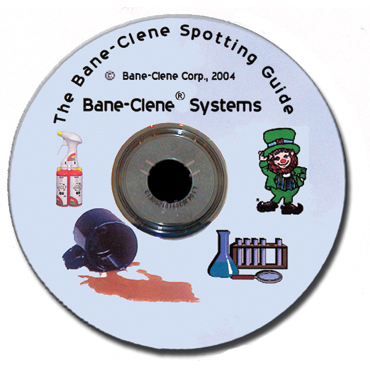 Video from a Bane-Clene carpet spot and stain removal class conducted by Bane-Clene’s chemist for professional carpet cleaners on how to remove oily soils from carpet such as petroleum oil, grease, paint, glue, etc.